Rochester, MN, September 4, 2018 – There is a strong seasonal pattern in seeking cardiovascular health information on Google, with higher search activity during winter months, according to a new study published in Mayo Clinic Proceedings. Investigators also found that US states with higher deaths from cardiovascular disease (CVD) have higher CVD-related search volumes compared with regions with lower CVD mortality. By integrating artificial intelligence in healthcare research, the data generated by online cardiovascular health searches could be leveraged in the future to estimate disease activity in the community. "By showing that seasonal and geographic interest in seeking CVD health information correlates with findings in real-world data, we show that Internet search-query data could potentially provide real-time information on CVD in the community," explains lead investigator Nilay Kumar, MD, of the Division of Hospital Medicine, University of Wisconsin School of Medicine and Public Health, Madison, WI, USA. CVD is the number one cause of death worldwide, and more than 600,000 people die from CVD in the United States every year. There is a clear seasonal trend of CVD, which has been described in many countries, with the highest incidence during the colder winter months. This pattern has been previously described for sudden cardiac death, heart failure, heart attacks, and abnormal heart rhythms. Similarly, it is well established that there are geographic differences in the rate of CVD and deaths due to CVD. For example, the southern US has higher rates of CVD-related mortality per unit population compared with other regions of the US. For this reason, in medical circles the Southern US is often referred to as the "stroke belt." Investigators hypothesized that during seasons of high risk for CVD, Internet search activity to seek information on CVD would be higher than during seasons in which the risk of CVD was lower. Similarly, they hypothesized that areas of the US with the highest rates of CVD mortality would have a greater population-level interest in searching for information on CVD than areas with lower rates of CVD mortality. To address these two questions, investigators obtained data from Google Trends, which is a repository of online search query data made publicly available by Google. 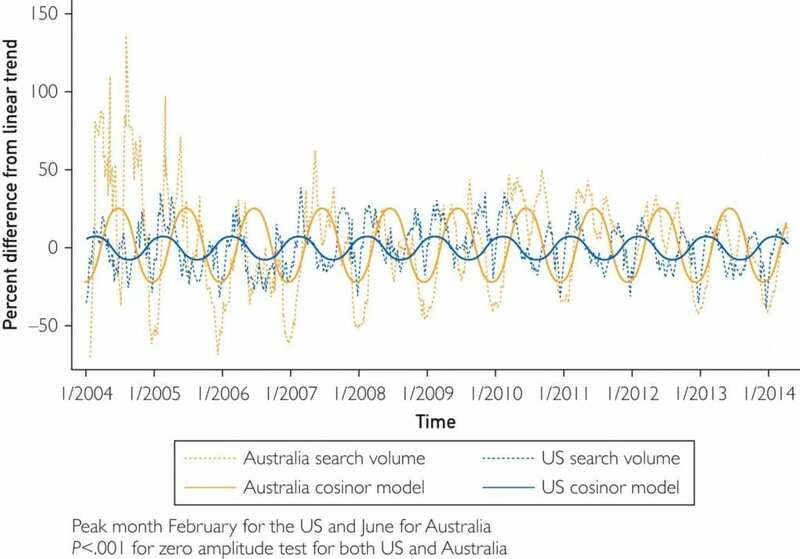 Using over ten years of search query data for 28 search terms related to CVD, they found that search volumes were 15 percent higher in the winter compared with the summer in the US and nearly 50 percent higher in winter compared with summer in Australia. They also found that US states with higher rates of CVD mortality had higher Internet search activity with respect to CVD. The significance of this research is that, in the current digital era, increasing rates of computer and smartphone ownership and increasing rates of high speed Internet access mean that vast amounts of data are generated as a result of everyday activities, such as searching the Internet and use of social media. When aggregated for the entire population, these data may provide insights into the population's interest in certain topics. Peaks in interest in certain healthcare-related topics may be driven by disease activity at the level of the community, say the investigators. "The key is to use big data, such as search query volumes, to augment traditional methods of CVD surveillance by providing real-time insights into population interests and behaviors," adds senior investigator and co-author Carl J. Lavie, MD, of the John Ochsner Heart and Vascular Institute, Ochsner Clinical School, The University of Queensland School of Medicine, New Orleans, LA, USA. "The failure of Google Flu Trends to predict the 2013 influenza outbreak should caution us not to fall victim to the so-called 'big data hubris,' but rather use it as one of the tools in our armamentarium for disease surveillance. Future artificial intelligence algorithms may incorporate passively generated data such as search query data or other forms of 'big data' to generate real-time predictions of CVD at the community level." In an accompanying editorial, Joseph G. Murphy, MD, and R. Scott Wright, MD, of the Department of Cardiology, Mayo Clinic, Rochester, MN, USA, equate these findings with a "canary in the coal mine" metaphor with the potential for using aggregated search data to alert public health authorities to trends in CVD mortality. "The 21st century canary will not be an unfortunate caged bird used to alert humans to environmental toxins but instead will be a virtual reality program triggered by individual Web searches and social media postings collected in aggregate and analyzed by public health authorities to facilitate the early detection of symptoms and diseases gathered on a nearly instantaneous basis," they comment. "The use of such a program would allow better targeting of resources and tools designed to reduce morbidity and mortality and empower individuals to live healthier and more productive lives. Dr. Murphy and Dr. Wright predict that Internet search engines and social media postings will not only act like the proverbial "canary in the coal mine" in the early detection of disease, but also "sing like a canary" in the dissemination of important public health warnings.